That's not a book, Steve. An official biography of Steve Jobs is to hit bookshelves next year, according to publishing house Simon & Schuster. It's the book that fanboys have been waiting for, as it comes with the official blessing of Mr Jobs himself. Unlike fellow Apple co-founder Steve Wozniak, Jobs has shied away from a book deal although you wouldn't know it from a quick Amazon search for his name. 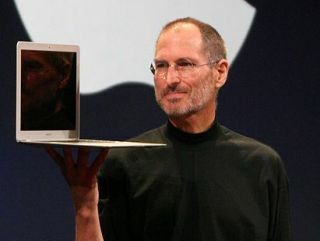 The book, titled iSteve: The book of Jobs (groan), is being penned by the similarly biblically surnamed Walter Isaacson. No stranger to biographical ramblings, Isaacson has authored books on Albert Einstein, Benjamin Franklin and Henry Kissinger, and has been working on Stevie J's story since 2009. As well as interviewing Steve Jobs himself, Isaacson has been talking to members of the Jobs clan, his colleagues at Apple and the company's many competitors. Aside from the fact that iSteve will be published in early 2012, the publisher is keeping all the juicy storylines to itself, saying that there are no further details available and neither Jobs nor his biographer would be commenting. How long after publication before Jobs: The iMovie goes into production? Place your bets.